Clean Approaches for Coaches is about creating the conditions for change within a coaching session, quite naturally and without giving advice, making suggestions, or interpreting your clients' needs. It answers a question many new coaches have: "OK I get that it is the client who does the work and that I have to keep my opinions to myself - but how do I do that?". Throughout the book, there are plentiful examples, diagrams and case studies to aid your learning. Written in a clear and engaging style, with quirky illustrations created by the author, this is not just a how-to book. It is also a story book and a reference book. And whether you are a new or experienced coach, and whether you are new to Clean Language or a veteran, this is a must-have book. read a review of this book by Ken Smith here. attend a course based on this book in person or online. "Clean Approaches for Coaches is superb! I really like the layout and the graphic look of the book but, more importantly, it is the way it is written that really impresses me. Marian has a wonderful way of explaining issues - she writes with great clarity and precision. I know this will be a book I will return to time and time again." "I received my book yesterday. Oh boy is it beautiful! I've only started to read it, but the tone is clear and engaging. The layout is great. Illustrations are detailed enough to clarify topics, but simple to leave room for your own overlying metaphors. The paper's of high quality: heavy and glossy. And the book stays open when layed flat - a huge quality criterion for me as well. Very well done! I've only started to read it during commute this morning; I'm eager to continue." "If you’re new to Clean Language, this beautifully organised and thoroughly user-friendly guide will take you by the hand and lead you through the initial strangeness of asking - and answering - Clean questions, and then through each important stage of working more “cleanly” with clients, including a very reassuring section on what to do when none of it seems to work. More experienced practitioners will appreciate the way each aspect of Clean is discussed in the light of current research and the way the often fascinating case-study transcripts (don’t miss “I Fart in Your General Direction”) are presented in bite-sized colour coded chunks with zippy illustrations and very helpful question-by-question commentary. One reason why this book works so well is because Marian Way spent five years figuring out how to present both the fundamentals and the fiddly bits of Clean in a way that follows the inner dynamic of an actual Clean session. Her great ability to present the convolutions of each client’s inner landscape clearly and coherently will make this book an essential addition to your Clean library." "Undergrad and law school ruined my mind. Undergrad teachers claimed that euphemisms, clichés, analogies, assimilations and metaphors were used by the weak minds that couldn’t think creatively on their own. Law school made everything about Logos. Your book, along with other books like The Story Factor and The Righteous Mind and have started to help me turn myself back into a human being instead of a legal minded robot. Humans, when communicating not in the context of law, communicate extensively with assimilations, metaphors and stories. The human responses I’ve gotten lately with these methods have been wonderful. And, I am not really a people person. As a matter of perspective, I’ve read some Carl Rogers and some Irvin Yalom on therapy. Both are dense reads and frankly, boring. What I love about humanity (and the occasional individual) is that the Clean Approach seems to use some of that human learning/therapy history as a metaphorical baseline and then takes deep communication much farther, in a simple way. It is a relatively fun read. I am not a book worm. I got a “D” as in “DOG” in freshman English - even though, as I tried to explain to my professor, I speak English. Thanks Marian, I hope it is not an insulting over-simplification." "Reading Clean Approaches for Coaches is like going through the clean coaching process itself: it’s fun, simple, iterative and entrancing. Along the way there is space for great insights, deep thoughts, sudden clarity and familiar recognition of old ideas in a new form. Marian’s book is a brilliant example of the very best of modelling – she takes something highly complex and serves it up in such a way that anyone can do it. She leaves you with nothing to worry about, just a range of clear tools to pick up, practise, lay down and return to. Marian writes personally and engagingly as the wonderful teacher she is. She takes me on her journey and points things out along the way so that I feel confident to make that journey again alone and find my own meaning along the way. Her illustrations and case studies bring a clarity to learning the process that stays with me long after I’ve closed the book." "I’m very new to Clean Language and found this book to be outstanding. The colors, imagery, diagrams, even the quality of the paper speak to me metaphorically - this book is important. And the bookmark was an unexpected surprise! I’ve begun using some of the questions, in a variety of circumstances, including sales meetings and when interviewing candidates for open positions and have been quite pleased with the results. Marian, your passion and enthusiasm is evident, and have enjoyed reading and working through the clean approach. It’s already on my “read again” stack." "Wise, simple, clear and concrete. Fun, easy to use and understand. Beautifully and coherently communicated. A new standard in how to usefully impart expert knowledge in what comes across as an effortlessly efficient way. Hugely recommended." 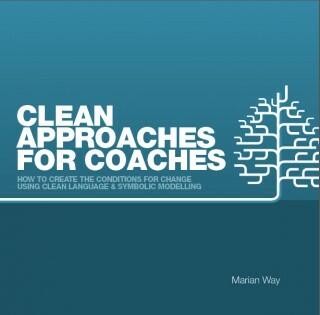 "Marian has captured the multi-layered and multifaceted world of working with Clean Language and Symbolic Modelling with simple elegance and eloquent clarity. The layout, the content, the colours, the case studies and explanations take you on a journey of discovery and exploration with Marian pointing out the many wonders to be noticed and guiding you on your way. Fabulous!" "I received the book on Wednesday and I couldn't put it down! Marian, you are brilliant. You explain things so clearly, and everything in your book, to begin with its structure, supports what you try to convey. For example how you start a case example, then leave it, start a new one and in the next iteration return to the first one, so the reader gets to experience firsthand that metaphors do indeed 'stick' and they are relatively easy to remember. Plus you teach flexibility and 'going with whatever presents itself' at the same time. You then do that within case examples as well. Also, your book is the first that gives me some concrete handles on the matter of which question to ask next when you are developing symbols. I've had difficulty asking for locations, and now I see why that is, and how I can better tell when that information is ready to be accessed. You reminded me that 'clean' also means that whatever you do fits with and follows from the internal logic of the client, and that the timing of a clean question also determines the 'cleanliness' of that question! So now I am starting to re-read, taking the time to soak up the details and all their implications and letting it all sink in."